Cat Vet in Wayne, NJ -- A Cat Friendly Animal Hospital! Tri-County Animal Hospital is a Cat Friendly Animal Hospital! Tri-County Animal Hospital loves your feline family member! 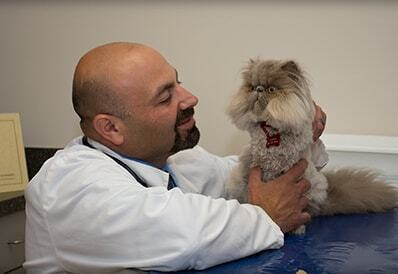 Our cat health care is designed to provide comprehensive long-term, life-stage veterinary care for your cat. We understand that cats have special needs (cats are not small dogs!) and we take extra efforts to treat our cat patients with a calm environment, and we try to ensure they do not come into contact with any dogs in the hospital. We are a certified Cat Friendly Practice and have embraced the higher standards of care needed to create a cat-friendly environment within our hospital. A cat friendly hospital means less stress to both you and your cat when visiting us. We recommend that we see your cat at least annually for a comprehensive wellness exam. It is important that we diagnose any health conditions your cat may be facing early, when treatment options are most effective. We will provide tailored vaccination schedules and helpful pointers on home care that will keep your cat healthy, happy, and protected against preventable illnesses.